At Snowcrest Foods we’re committed to giving back to our communities to help them grow and prosper. Our involvement in the environments in which we live and work is a meaningful pursue for our leadership team and in turn our employees. donations, sponsorships, both locally and globally. 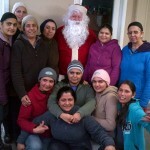 Our charitable givings are a natural tradition for all stakeholders in the Snowcrest family. We seek out individuals and partners who fit the culture of “Making a Difference” with ongoing “Acts of Kindness”. Our family of employees are encouraged to give back when possible. To build this culture among our team, we at Snowcrest try to support initiatives that our employees and their families are involved in. 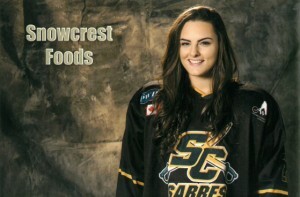 Snowcrest Foods sponsored Madison Field(Todd’s daughter) when she was playing for the Stoney Creek Sabres. 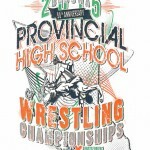 BC Provincial High School Wrestling ChampionshipsSnowcrest Foods was a sponsor of the event. We are dedicated to serving the community in which we work. Our staff and employees are at times paid to volunteer at local events or causes. At Snowcrest Foods we believe that no act is big or small as long as you believe in what you do. That is why we make an effort to donate frozen fruit products when the opportunity is presented. 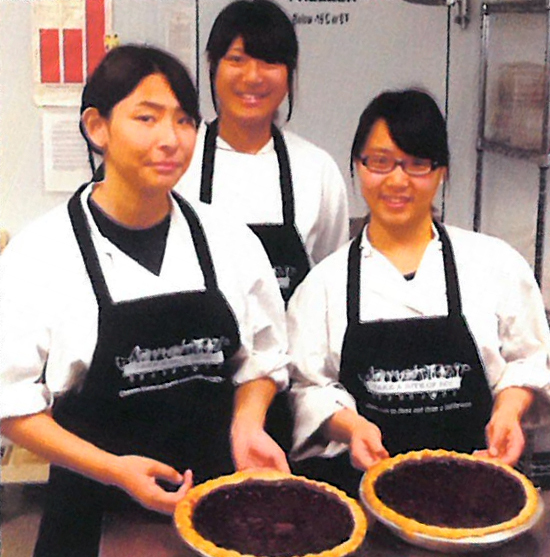 One of the benefits given to the Snowcrest Foods employee is funds to purchase new safety boots every year. Several years ago we started a program whereby employees must hand in their “old” boots which we then donate. We realized that many of the boots were not really worn out in one year and we had heard that the Salvation Army needed safety boots to for those in the community who were entering the work force but needed safety boots. 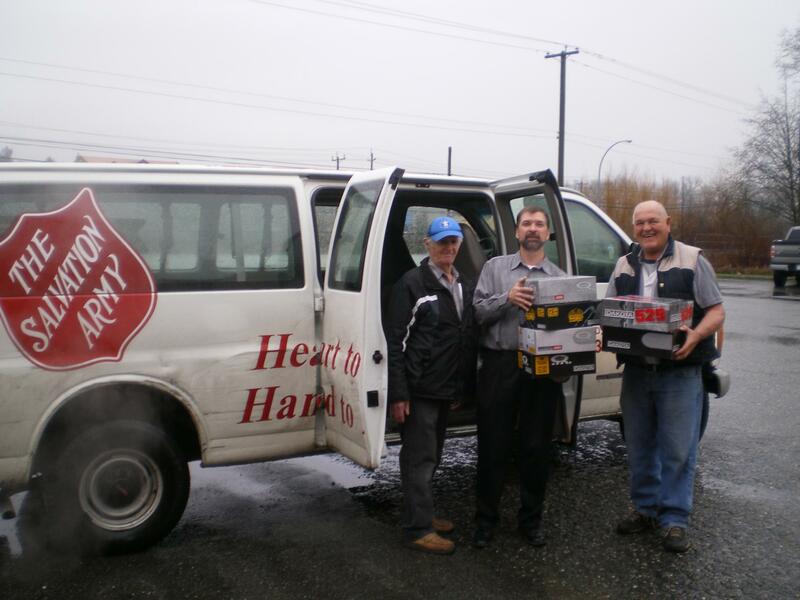 We contacted the Salvation Army and they were thrilled to come pick up the boots provide them where needed. 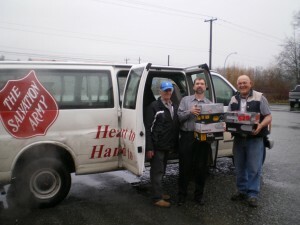 Dan Lennox, Snowcrest’s Senior Accountant, is shown helping load the boots into the Salvation Army van. Our safety boots donation is an annual event. Blueberries were appreciated by all! – “We served a blueberry pancake Welcome-Back breakfast” – Chilliwack Secondary. Snowcrest Foods Annual Staff Christmas Party with Santa! At Christmas every year we have lunch altogether. A special guest usually arrives right after the lunch is done. 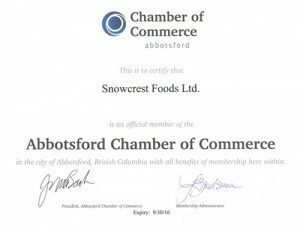 Snowcrest Foods has long standing relationships around the world, so we feel that we should be doing our part to help regardless of where in the world we are. 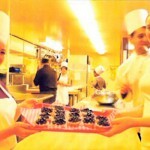 We understand that our partners at the corporate level work with organizations they support. That is why we at Snowcrest are always looking for opportunities to collaborate with our partners. It’s true what they say: there is power in numbers, especially when trying to do a good thing!